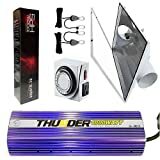 The Thunder 1000 Watt Digital Dimmable Grow Light System is a complete 1000 watt grow light system from Thunder. 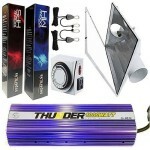 It comes with a 6 inch air cooled Sunlux XL reflector, a digital and dimmable ballast and a MH and HPS bulb. You also get a timer and light hangers too. This grow light kit is ready to rock your world and grow some incredible plants for you. 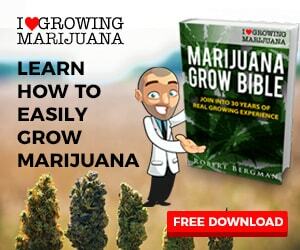 You don’t always have to spend a ton of money to get good grow gear. 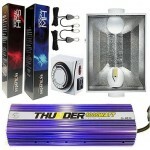 This Thunder 1000 W system proves that and it comes with a 5 year warranty too. You get a large34″ x 26.5″ x 10″ grow hood for great light distribution and penetration. Your buds will thank you. Throw this in a 4×4 tent or grow area and stand back! Buds will be exploding out the door! I really wish they had stuff like this when I first started growing. At Thunder®, we are serious about customers and quality. 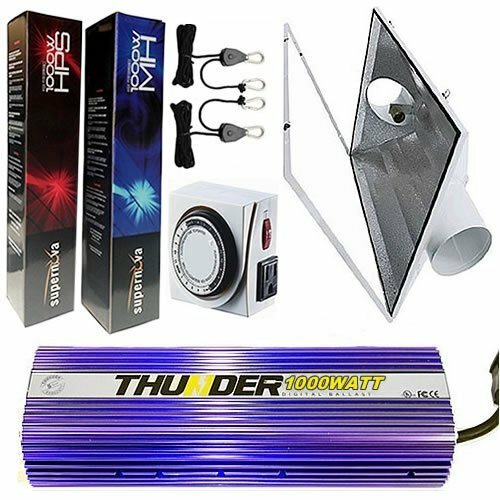 We figure out that the best way to earn your business is by providing the best service and quality at the lowest price possible for all of our grow light kit. 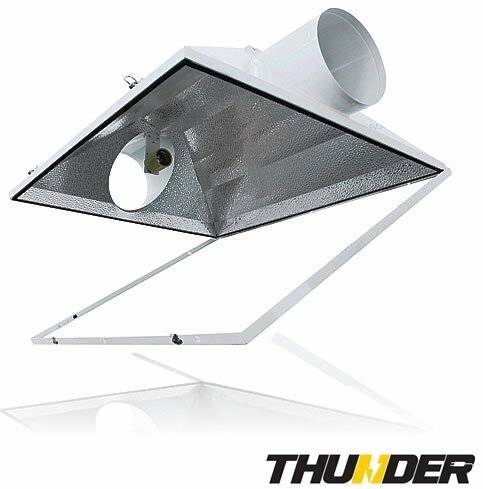 Our Thunder brand reflectors, ballast, tents, and fans are all covered by our 5 Year Warranty. 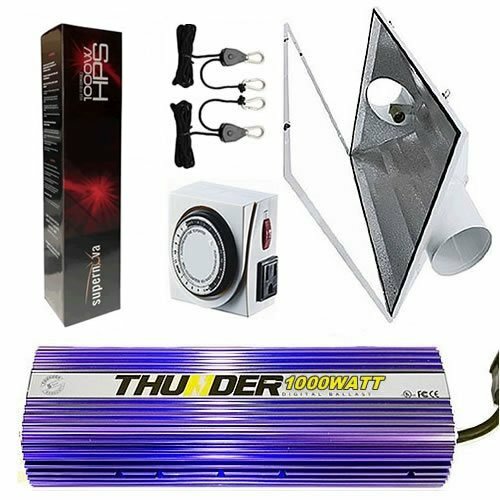 So you can be sure that the grow light kit you purchased are made at the highest standard possible. We believe that yielding better quality, larger grows don't necessarily mean a higher price tag. In fact, we are willing to PRICE MATCH against any other competitor's equipments under similar classes. The consistency our team delivers year after year, along with unbeatable service, makes up the complete package our customers deserve. It is our commitment to be the grow light company that you'll want to do business with again and again. 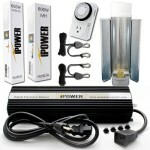 1 x 1000-watt super HPS Bulb. Ballast and Reflector have a 5 Year Manufacturer Warranty ! 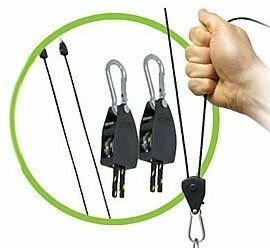 1 x Pair 1/8" Adjustable Grow Light Rope Rachet Hanger with Patented SUREGrip. SUREGrip's patented system pulls tight, locks in place, will never break or slip, and will not rust. 8 ft Rope Carbon Filters or ventilation equipment. Maximum weight capacity is 150 lbs. a pair. 1 x Thunder (TM) 24 Hr Dual Outlet Grounded Timer for Ballast Light. Dual Outlet Mechanical Timer allows you to control two(2) devices with one timer. It comes with a manual constant ON override switch and can be set in 15 minute intervals. 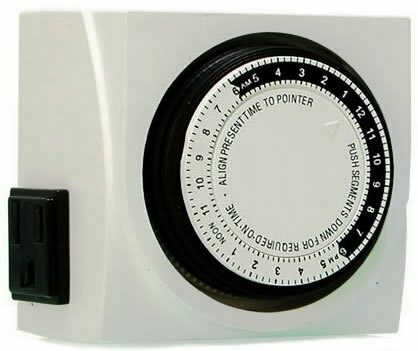 This timer is only for indoor used. This timer is only for indoor used. THIS WILL WORK FOR HOUSEHOLD APPLIANCES OR HYDROPONIC LIGHTING OR BALLAST. Works perfectly with THUNDER BALLAST and LIGHTING. 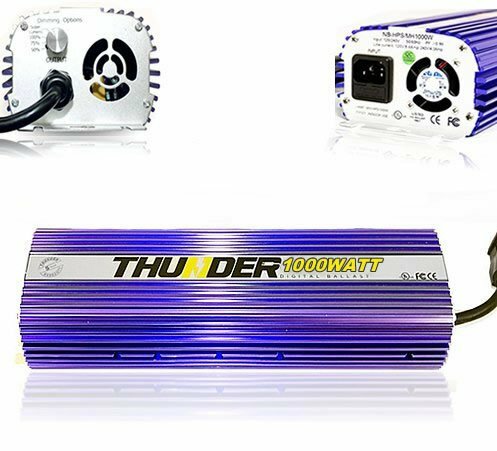 1 x 1000 Watt ballast features a high power factor, high luminous efficiency, adjustable wattage output, and works on 120v or 240v, worldwide compatibility! Compatible with HPS and MH bulbs. Lamp Dimming Option From 50% / 75% / 100% with extremely 99.9% Efficiency. Most forgiving power-source. You can run lights up to 65' away from the ballast and this ballast will increase lumen output by a whopping 30% without using anymore electric over traditional ballasts! 5 Year Warranty that is equal to the best in the business. Coupled with the quality construction and the fact that it runs 30% cooler than other ballasts, this is one of the best choices in the market. 1 x Sunlux (TM) 6-Inch Large White Air Coolable Reflector for Plants with (5 Year Manufacturer Warranty !) Dimension 34" x 26.5" x 10" (L x W x H) / Vent Size 6" Broad Light Dispersion with tempered Glass broadens the amount of light allowing close placement of plants for. Equipped with a collapsable glass panel for easy lamp replacement. Steel construction encased in fully heavy duty poweder-coated galvanized steel. Made 95% reflective German aluminum for excellent reflectivity. Equipped with an integrated rentation bar for an air tight seal and solid grip of glass. Fully packaged with built-in socket, 15' pre-wired lamp cord. 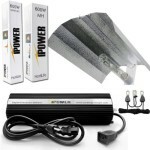 Compatible with HPS and MH bulbs 250W - 1000 W. Compatible with Square or SL Reflector Light Socket. Socket E39. Air Tight Seal: Equipped with an integrated rentation bar for an air tight seal and solid grip of the glass. 5 Year Manufacturer Warranty !